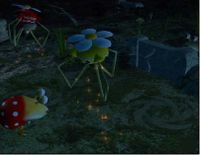 The term hazard in the Pikmin games refers to anything that can harm or kill Pikmin, including the creatures, non-living traps, and other dangers on PNF-404. In general, hazards are merely concepts, not objects, i.e. a hazard is the potential danger, not the object that actually emits the danger. Pikmin 2 lists the existing hazards on its sunset menu screen. All types of hazards are listed below. Hazards that suffocate the top of a Pikmin's stem – fire, water, and poison – will cause Pikmin to run around in panic. If they are not rescued after a few seconds, they succumb to the hazard and die. They can be saved by being whistled, although they can simply be bumped against by a leader in Pikmin 3. In Pikmin 2, if a Pikmin is under the effects of an ultra-spicy spray, stem-related hazards take half the normal amount of time to kill it. Fire usually occurs as torrents of flame spat by fire geysers and some enemies, although there are also enemies that have fiery bodies. Only Red Pikmin and Bulbmin are immune to fire. Other Pikmin burn up, and leaders that aren't adequately protected will also take damage. Water being ejected by a Watery Blowhog. The water hazard effect is sourced from pools of water, and water released by enemies. Pikmin that enter water bodies start to drown, but have a chance to survive if they are repeatedly whistled toward a shore. Pikmin hit by jets or globs of water panic and suffocate until whistled. Only Blue Pikmin and Bulbmin can safely travel in water or resist water-based hazards. Electricity is a dangerous hazard in Pikmin 2, but a non-fatal obstacle in Pikmin 3. Pikmin that get zapped in Pikmin 2 die instantaneously, while Pikmin in Pikmin 3 get stunned into a paralysis, until whistled back up. Some enemies and obstacles emit electrical currents, and electric gates are constantly electrified. Only Yellow Pikmin and Bulbmin are immune to electric shocks. Leaders that aren't protected with shock-resistant equipment will be damaged and get knocked down to the ground. Poison is hazardous gas that Pikmin cannot breathe. Gas pipes and some enemies emit clouds of poison. Only White Pikmin and Bulbmin can withstand poison. Since leaders are inside their spacesuits, poison does not affect them. Although not commonly considered hazards like the four elemental ones, the following dangers also exist. A bomb rock close to detonation. 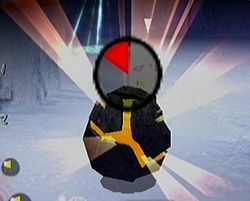 Bomb rocks explode, and any Pikmin caught in the blast will die. Leaders will also be severely hurt. In Pikmin and Pikmin 3, Pikmin can carry and throw bomb rocks at enemies, making explosions both a tool and a danger. 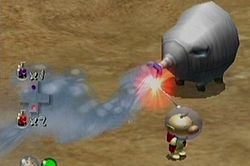 In Pikmin 2, bomb rocks are mostly a threat to the player's group, and the attacks of a Gatling Groink or Man-at-Legs also count as explosive hazards. Some obstacles and enemies can crush Pikmin and leaders. This is fatal for all Pikmin except Rock Pikmin and Winged Pikmin. Some enemies can also stab Pikmin, which is not fatal on its own but does lead to enemy-based Pikmin deaths. Rock Pikmin are also immune to stabs. Unlike crushing, Winged Pikmin aren't immune to stabs. Pits are bottomless chasms outside the boundaries of every sublevel of every cave, as well as the bottomless pit in The Forest Navel. If Pikmin are thrown over the edge of the level or leave its walls or floor by a glitch, they fall to their deaths. Enemies can be killed by this as well, a strategy that can be used to one's advantage. As the most common hazard, enemies play a major antagonistic role in each game. The vast majority of beasts can kill Pikmin in some way, be it by eating them, sucking them up, or employing other hazards such as fire, water, electricity, poison, bomb rocks, and blunt force. Some enemies even blow Pikmin away into other hazards, and some can scare or distract Pikmin into danger. Enemies that are harmless to Pikmin can be found here. Panic is a hazard that causes the Pikmin to run around in a frenzy, but will eventually fade away and not cause any damage to the Pikmin. It can also be solved immediately by calling a panicked Pikmin with the whistle. Panic has taken many different forms throughout the series, and is sourced from many enemies. In Pikmin 2, Purple Pikmin are immune to standard panic. Two Red Bulborbs hunting for prey at sunset in Pikmin. At the end of the day, all Pikmin not in the landing area, in a leader's group, or planted in the ground will die – they will be eaten by aggressive nocturnal beasts. During the liftoff cutscene at sunset, Pikmin seen running from enemies indicate the type (and after Pikmin, the number) of Pikmin left behind. Enemies can also be killed during this cutscene by White Pikmin or other enemies. Webs are hazards that cause a Pikmin to become stuck. A Pikmin can eventually be freed from a web by whistling to it. So far, Arachnodes are the only enemy seen to create webs. If a Pikmin is caught on a web, the Arachnode will attempt to eat it. If the Arachnode is killed, the web will disappear. Winged Pikmin are especially prone to being caught, as they cannot walk under the web like other Pikmin. Waddlepuses and Peckish Aristocrabs can release a stream of bubbles which trap Pikmin and leaders. Bubbles that catch anything pop after some time, and all bubbles pop if a thrown Pikmin hit them. Bubbles that catch leaders will also pop if the player controls the leader by quickly shaking the analog stick for some time. Winged Pikmin can be told to charge at a bubble, but if too many of them charge it at once, the bubble will rise up to the sky at a ludicrous speed. This page was last edited on November 23, 2018, at 13:05.